Harrisburg, PA – Pennsylvania Department of General Services Secretary Curt Topper today announced that the department’s Public Works Modernization initiative recently received national recognition by earning e-Builder’s 2017 “Innovators in Construction” award for the public sector and statewide honors by receiving the highly competitive Governor’s Office of Transformation, Innovation, Management and Efficiency, or GO-TIME, Award. Through a partnership with e-Builder, the Department of General Services streamlined the way it manages building projects for state agencies, integrated all processes from capital planning, design, electronic bidding, construction and project closeout. Along with these integrations, anyone from senior management to contractors working on a job site, are able to access a multitude of reports and create customizable dashboards. This implementation also resulted in Public Works moving from a paper world, to being virtually paperless. The department is currently managing 183 design and 80 capitol construction projects in the new system. The department also used the modernization initiative as an opportunity identify inefficient processes, streamline them and then use technology to implement changes. Under the previous paper-laden process, it took five days to input bids for a single project. Today, the same task can be completed in a matter of minutes. Secretary Topper also noted that it used to take the department an average of 79 calendar days to identify, authorize and approve a single change order. Thanks to a process improvement that gives field staff the ability and authority to handle change orders up to a certain amount on the worksite, combined with the e-Builder software solution, the time is down to an average of seven days. “In fact, the first change order to go through the process using the e-Builder technology was completed in about five hours!” Topper added. The e-Builder Innovators in Construction award recognizes organizations that demonstrate excellence in using technology to drive substantial building project budgets and schedule savings. See the project award video here. The GO-TIME Awards are presented annually to recognize initiatives that are improving state government operations through cost-savings to taxpayers, efficiency gains for employees and better customer service to the public. 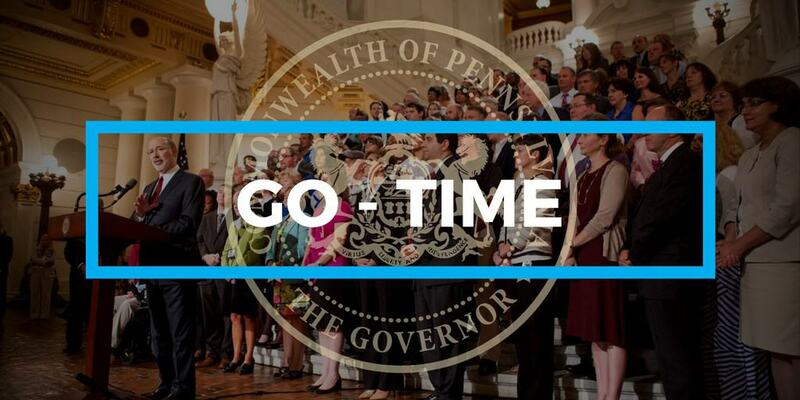 To learn more about GO-TIME, visit www.governor.pa.gov/go-time.